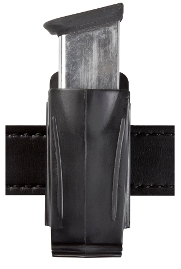 Upon seeing Bill Rogers wearing one at the 2011 Law Enforcement Training Camp, I decided to order a Safariland 71 magazine carrier. It is an injection molded, totally ambidextrous (Mik3's lefty seal of approval!) magazine carrier with an integral belt loop. When I finally got it attached and set to the right location, it yielded some pretty decent presentations with my full-size GLOCK 9/40-form factor magazines. The pouch was a little slower than the Safariland 074 pouches that I'm using now, but I attribute that to lack of familiarity. At ~$15.00 a pop, these are pretty cheap, and fit in a rangebag for loaner or spare use if necessary.